Sapele body concert ukulele with passive pickup. Sapele body and neck and rosewood fingerboard and bridge. Fitted with geared tuners and a passive piezo pickup with volume and tone controls. 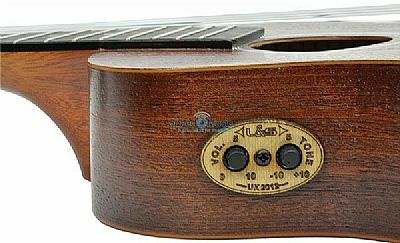 The popularity of the ukulele has grown to great proportions in recent times and the ukulele is now being used by acts like Portishead to Van Morrison to Florence and The Machine. The Chord SU21E Electro-Acoustic Concert Ukulele has been designed to meet the demands of the market, by combining the elements of selection, quality and price.